This book fills a gap in the literature by setting food security in the context of evolving global food governance. Today’s food system generates hunger alongside of food waste, burgeoning health problems, massive greenhouse gas emissions. Applying food system analysis to review how the international community has addressed food issues since World War II, this book proceeds to explain how actors link up in corporate global food chains and in the local food systems that feed most of the world’s population. It unpacks relevant paradigms – from productivism to food sovereignty – and highlights the significance of adopting a rights-based approach to solving food problems. The author describes how communities around the world are protecting their access to resources and building better ways of producing and accessing food, and discusses the reformed Committee on World Food Security, a uniquely inclusive global policy forum, and how it could be supportive of efforts from the base. The book concludes by identifying terrains on which work is needed to adapt the practice of the democratic public sphere and accountable governance to a global dimension and extend its authority to the world of markets and corporations. This book will be of interest to students of food security, global governance, development studies and critical security studies in general. Nora McKeon is engaged in teaching, writing and advocacy on food issues and social movements, following a career at the Food and Agriculture Organization (FAO) of the United Nations. She is the author of Global Governance for World Food Security (2011), The United Nations and Civil Society (2009), and Peasant Organizations (2004). 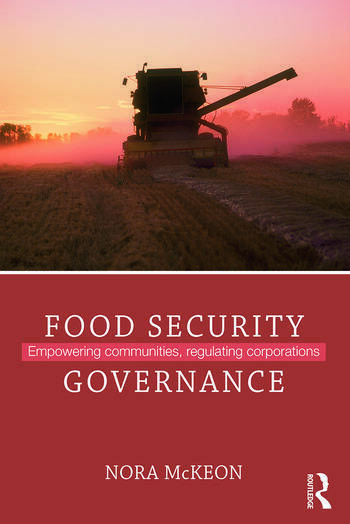 ‘Food Security Governance; Empowering Communities, Regulating Corporations’ is a must read for anyone striving to understand the grammar of the global food system, and what can be done to support the building of the existing alternatives. Food Chain Vol. 5 No. 1–2, Patrick Mulvany, Director of Kamayoq. This book illuminates challenges and emergent possibilities within the global agro-food system and invites readers to become engaged in fostering food rights at home and around the world. Written in an engaging style, the book is suitable for a wide audience. Many readers will find the numerous textboxes useful in explaining central theoretical concepts, providing illustrative examples, and presenting key movement insights and approaches. This book is recommended for classroom use in advanced undergraduate and graduate level social science courses related to agro-food studies, globalization, and development.